Brownies are notorious for being difficult to get just right. Since going vegan, brownies are the one dessert that I have had the least success with. There’s something about not having the egg in there that just makes it difficult to get the perfect texture. I’ve tried a few vegan brownie recipes on the blog so far and while they’ve all tasted great, I haven’t found the one that makes me say “this is it”. This might be it. It’s pretty damn close to my perfect brownie. I love my brownies dense and rich with a crispy crust. I’m not a fan of cake-like brownies. If I want cake, I’ll make a cake! Mind you…I’ll pretty much eat any brownie that’s put in front of me without a single complaint. Duh. Now, throw gluten-free and vegan into the mix and it’s almost doomed for failure. But it can’t hurt to try. Apparently it can. It can hurt real bad. The very first brownie I made was our least favourite and biggest shocker. I used a mix of all-purpose and whole wheat pastry flour. The result was a cake-like texture and the flavour didn’t wow me like I hoped. I will not be sharing this recipe with you today as it needs more work. After that, I decided to switch up my flours to get the dense brownie I was looking for. In the vegan version (on left) I used a mix of all-purpose flour and almond meal/flour. The texture and taste was so much better than the first version! For the gluten-free version, I used a mix of brown rice flour, almond meal/flour, and arrowroot powder. I was really surprised at how close I could get the gluten-free version’s texture to the regular vegan version. Both were winners, but I’ll tell you which one we liked best at the end of the post. Oh, suspense. Dense, nutty, with a crisp crust and flakey top. Come to mama. 1. Preheat oven to 350F. Line a 9 inch square pan with parchment and grease all sides. In a small bowl, whisk together the ground flax and water and set aside. 2. In a blender or processor, process almonds into a meal/flour. Sift out large pieces. Or use store bought almond meal/flour. 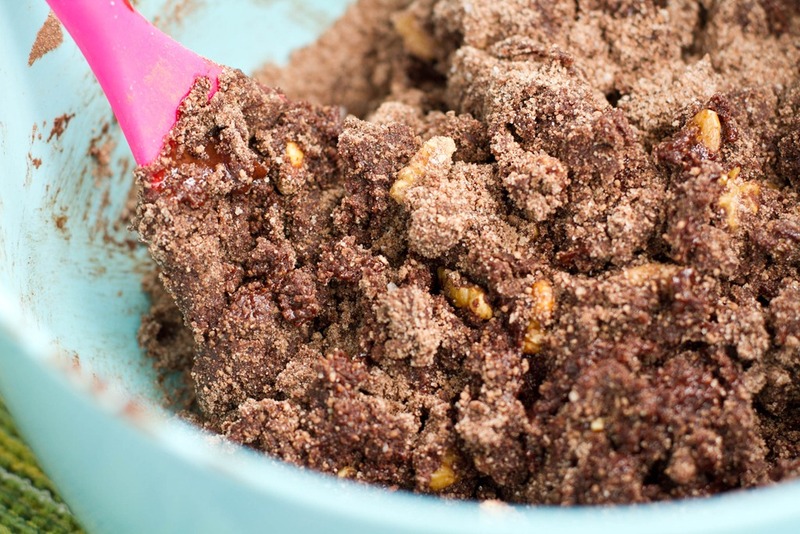 In a large bowl, whisk together the dry ingredients (flours, cocoa, salt, soda). 3. In a large microwave safe bowl, add chocolate and Earth Balance and melt in microwave for about 30-45 seconds until melted. Stir well and add in flax egg, sugar, vanilla, and milk. Whisk. 4. Pour wet mixture over dry mixture and stir well. The mixture will be VERY dry, but not to worry keep mixing! Now fold in the walnuts and remaining 1/4 cup chocolate chips. 5. Scoop batter into prepared pan and place a piece of parchment on top. Spread with hands or a pastry roller until smooth and even. 6. Bake for 32-34 minutes at 350F and allow brownies to cool in pan for about 1.5 hours. DO NOT REMOVE BROWNIES (uh oh I’m yelling!) until completely cool or they will crack apart. After an hour or so, gently separate edge of brownie from pan with a butter knife and place on a cooling rack. Cool completely and slice carefully. Some cracking when slicing is normal and I say it gives the brownies character, right? Store in air-tight container for up to 3-4 days. I love a crisp edge on a brownie! The key for brownie success is a very thick batter. It’s so thick, you think you did something wrong. Unless of course you forgot the flax egg (see brownie disaster above). Scoop the thick dough onto the pan and spread it out. I placed a piece of parchment paper on top and rolled a pastry roller over it to smooth out. It’s a bit annoying to work with, but the effort is worth it! Ridiculously good. Dense, nutty, with a crispy crust. Our favourite vegan brownie to date and gluten-free too. No one will ever guess these are vegan and gluten-free! 2. In a blender or processor, process almonds into a meal/flour. Sift out large pieces. In a large bowl, whisk together the dry ingredients (flours, arrowroot, cocoa, salt, baking soda). 5. Scoop thick batter into prepared pan and place a piece of parchment on top. Spread with hands or a pastry roller until smooth and even. 6. Bake for 35-37 minutes at 350F and allow brownies to cool in pan for about 1.5 hours. DO NOT REMOVE BROWNIES (uh oh I’m screaming!) until completely cool or they will crumble…you were warned! After an hour or so, separate edge of brownie from pan with a butter knife and place on a cooling rack. Cool completely. I like to leave my brownies out overnight (uncovered) and cut them in the morning. Store in an air-tight container. Will stay fresh for up to 3 days. 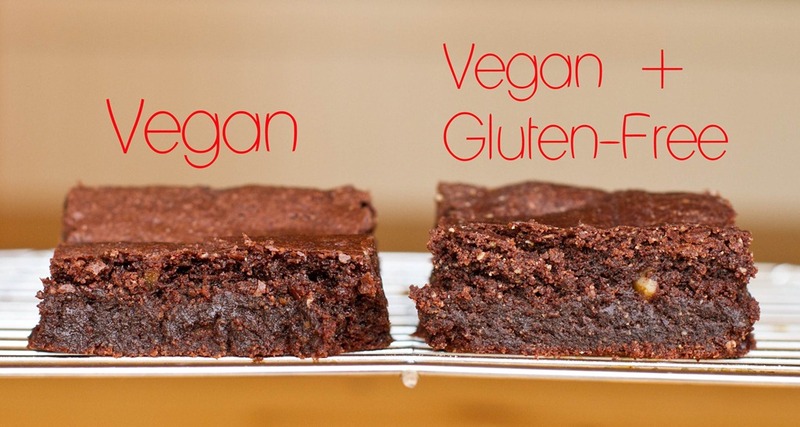 Two excellent vegan brownie recipes. I put on my Mad Scientist coat and did a Blind taste test on Eric. He preferred the gluten-free and vegan brownie to the vegan brownie made with all-purpose flour. I also preferred the GF brownie. I never thought either of us would have concluded that, so it was quite interesting to say the least! Whichever you make, you really can’t go wrong though. Served with creamy almond milk? Now you’re playing with my heart strings. This recipe is great! Nice cakey brownies. Cause I switched to a lower carb, Raw Till 4 diet, I switched from flour, more to black beans, as the main ingredient. Lowfat, No sugar, Lower carb, High protein, Vegan. That is the best looking brownie I’ve ever seen. My mom used to make the best fudgy brownies. I’ve been afraid to even attempt a vegan version! Perhaps this will win out over mom’s. I can’t wait to try out the brownies and let him try some too! My recent food sensitivity tests show I won’t need to go gluten-free (more in a future post), but I’m def. open to baking more gluten free options! I hope to do two versions for some recipes because I love the challenge and I also think GF foods can taste great. 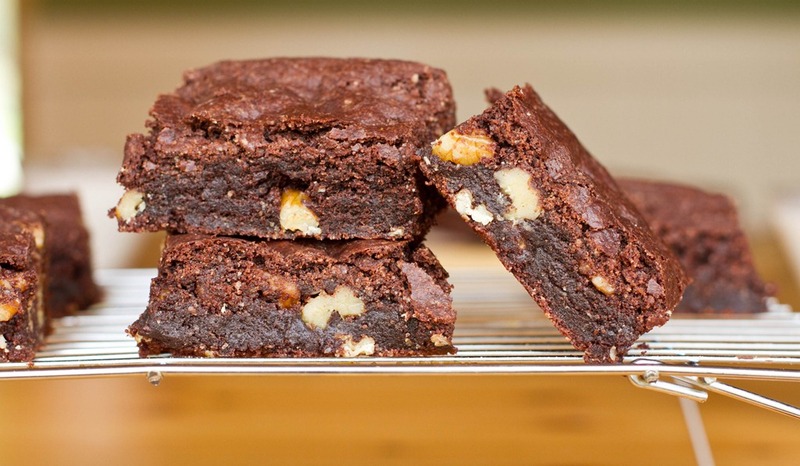 Do you know what specific ingredient/balance of ingredients causes that flaky top on brownies? The brownies I made with more sugar seemed to have a flakier crust, although I’m sure it could have been due to other things. Oh my, I’ve died and gone to brownie heaven! I’ve been looking for a gluten-free brownie recipe and have yet to make one that tasted decent. I have a feeling this one could be a winner. I’m thinking of adding in a little peanut butter in place of the walnuts. Do you think that would be a good idea or would it make them too dense? Thanks for this tasty recipe, Angela! In my experience, vegan brownie recipes are VERY sensitive to changes, so I don’t know how it would turn out. It’s anyone’s guess! maybe I will have to try a PB version. That really does sound amazing! I know I am replying to very old post but I remembered these when wanting to bake for a potluck for some coworkers that were, between the three of them, lacotse-itolerant with either soy or egg allergies. These guys never get baked goods at work, so I was a bit of hero thanks to you. I used peanut flour in place of the almond flour and subbed 1/4 cup coconut oil + 2 T pumpkin butter for the butter and they were super yummy. I can’t wait to try the gluten free version!!! This is making me want chocolate so badly! Can I fly to your place and have one of these with a tall glass of Almond Milk?? These are DIVINE!! Way to go!! Do you have a suggestion for an almond flour sub? I’m allergic to almonds and am trying to find a similar weight/texture flour. I’m not too sure, but maybe a more experienced GF baker can chime in with ideas? I would think you could use a bean flour in place of the almond flour (like white bean or garbanzo flour), although they would probably be DELICIOUS with coconut flour! PS- I hope your tummy is doing better. My tummy troubles appear to be more stress/anxiety than food related, so I dont know if thats a good thing or bad thing. lol. I make a pretty good brownie (GF, vegan and nut free). I’ve found mixing flaxseed meal, coconut flour, tapioca flour and GF oat flour makes a great texture. I’ll have to play around with your recipe – looks yummy! What does tapioca flour taste like? Tapioca flour is made from the root of the cassava plant, once ground it takes the form of a light, soft, fine white flour. It has a slightly nutty flavor, very mild in ovr all flavor. Tapioca flour adds chewiness to baking and is a good thickener. It’s a fairly resilient flour, so storing at room temperature is no problem. No gluten, natural. I’d love to try out your nut-free recipe if you’re willing to share! I have a bag of coconut flour that I was gifted and don’t know what to do with it. All of them look delish! Tapioca starch, in my experience, is really gooey when you cook with it, which might lend a bit of binder-like chewiness to baked goods, and it’s GF of course. I need to get one of those small rollers! They look so handy to have. I have to make those vegan & GF ones!!! I’ve never been successful making GF brownies… They always crumble into a big mess. I think a big part of it is allowing them to cool completely before attempting to remove/slice. I let these cool for about 1.5 hours. I find the parchment trick works well too. I’m so glad you all liked the GF one the most! I was going to be upset if you didn’t, haha because i can’t make the non GF one! 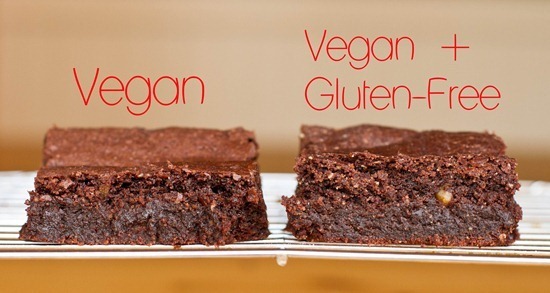 I’ve found the opposite actually…most of the vegan brownies I’ve tried are cake-like. But maybe that’s because I have been trying the healthier ones. I will have to check out that recipe! Oh man…and I thought I was craving chocolate BEFORE I read this…now I’m doomed. 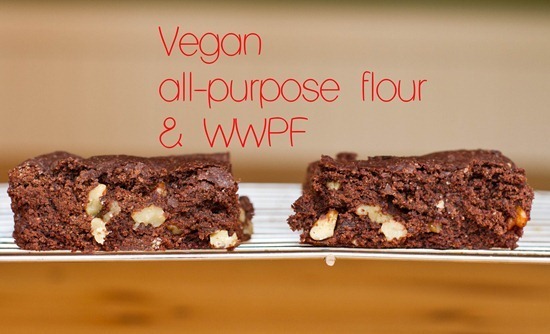 I will definitely try this out, I have lots of fun trying vegan baking! Can’t wait to try them both! Wow, I can’t believe the Gluten Free version won! That’s great! I’ve also been trying to make a vegan brownie and really really dislike the cake quality. When I’m craving brownies, give me something gooey, practically like batter. I can’t wait to share this with my mum, who is convinced you can’t get the same texture without using the mix from a box. Thanks for sharing! I hope it passes her test! mint would be amazing….as would PB as someone mentioned above. Mint swirl? PB swirl? pumpkin? These are some of the best brownies I’ve EVER seen! Yum! Cake-like brownies are a no go for me. Must be dense, rich, fudgy, pretty much a thick, solid, really dense slab of fudge is how I like them. That is so interesting about the GF being the preferrred…I imagine that somehow the almond flour gave it that heaviness and density that is great in brownies; not so good in a white birthday cake. At least that’s my experience w/ almond flour. And “I placed a piece of parchment paper on top and rolled a pastry roller over it to smooth out. It’s a bit annoying to work with, but the effort is worth it!” <— I have been searching for something like that! Where did you get it? Pastry store? Online? You are exactly right about the almond flour! I’ve found it gives a density and sweetness to cookies and brownies. Not so great in large amount for fluffy baked goods though, but in small amounts, I find it’s nice. What could I substitute for the ground flax? I’m very allergic to it. I was looking so forward to making these this weekend! Thanks. I’m sorry to hear that Jennifer! Can you do chia seeds? Ground chia seeds MIGHT work, but chia does absorb more water than flax so Im not sure how that would effect the overall brownie. Okay, thank you. I will give that a try! Can’t wait to try them. I’m not a fan of cakey brownies either and most vegan recipes I’ve tried seem to end up that way. Crisp on the outside and fudgey on the inside all the way for me! Angela can I use whole wheat pastry flour for the brownies? Also can I use cocoa powder? Thank you. I didn’t have great results when using WWPF so I would not recommend it. And yes, cocoa powder is used in both recipes. You are a baking goddess! I love that they have a crust on the outside… That’s the best part… Can’t wait to try these! You are reading my mind. I’ve been craving brownies for weeks and really wanted to find a healthier version that was just as decadent. I’ve also had a lot of success making GF vegan & fat free brownies with oat + quinoa flours (fresh ground from whole quinoa and steel-cut oats – both uncontaminated GF certified) instead of whole wheat pastry, and no other subs to the recipe. so excited to try these!!! yum yum! These brownies look awesome! Must try! When you say non dairy chocolate, do you mean vegan chips or something like this? Thanks for all your great recipes! How is your cookbook coming along anyway? I would be one of the first in line, even though I have my own version scattered about the house from printing them every other day!!! Im working with an agent now and working on my proposal, coming along quite well! If I make both of these, you’ll see BOTH the recipes gone by midnight…or even less. I will eat and lick every crumb I see ;] which is also why I had to reduce my baking days to only Saturday and Sunday and sometimes Wednesday ._. Oh my word! That looks amazing. Me & my fiance are going to bake one of your desserts for my birthday on Monday but I can’t decide which one!! Any suggestions? Which is your favorite? I think I def want to do something with chocolate. These look so delish! I have to admit, I made vegan brownies with avocados and the results made me not want to EVER try vegan baking again. You may have changed my mind! Oh my gosh… I just tried making black bean brownies. Two different recipes two nights in a row. The first had banana and just tasted like mashed banana. The second tasted ok… but not really great and they didn’t really bake in the middle. I’m on a mission to try to make a vegan, gluten free, processed sugar free, oil free brownie. It’s hard! That’s a lot of ingredients to switch out!!! Hey Jen, I can feel your pain! I’ve been testing black bean recipes for over a year now and nothing yet I’d share. haha. I know ppl rave about them but I can’t get over the texture! At least it’s not just me! 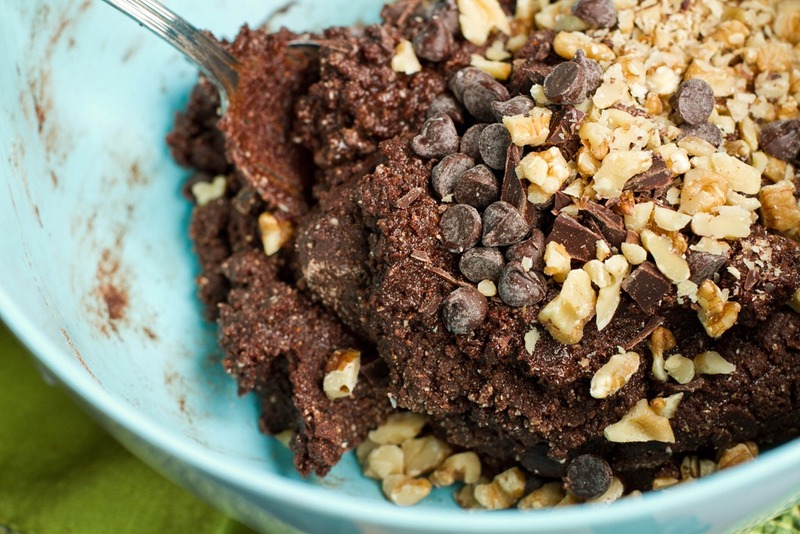 I love the idea though… I just want a healthy dessert that is chocolaty and I can feel good about eating lol! The first one I tried had banana in it and it was awful. It just tasted like beans and banana. My friend said it tasted like rellenitos – plaintains stuffed with beans and a little cocao. Then I tried a different recipe. It tasted better, but still had the consistency of refried beans! exactly, how do you make avocados don’t taste sour after being cooked? is it temperature, or any ingredient? Dang I wish I saw these before I made a different brownie recipe today. Thankfully thanks what my recipe folder is for! Is it wrong I wanted to eat it out of the bowl? These look delicious! It has been a chocolate craving week! I also love brownies that are crispy on the outside, but dense and almost fudge-lke on the inside. I’m kind of shocked that you both preferred the gluten free version – I’ve had bad luck with most gluten free recipes I’ve tried, especially for things like brownies. Can’t wait to try your recipes! Can’t wait to try these. My mom has coeliac (so she has to eat gluten free) and is very picky about her brownies so I can’t wait to make these for her! I am going to try these for Thanksgiving! Thank you! I can just tell from the pics that these are incredible! They look SO fudgey! Just how I like my brownies. And you totally won my over with the addition of walnuts! Can’t have brownies without them! I am making these tomorrow morning for breakfast. Don’t judge. These are so fudgey, no one would ever guess they’re vegan! I like my brownies almost under-cooked, but superdense ones work for me too. Who am I kidding? All brownies work for me! Wow incredible. Baking is such an exact science, and throw GF and vegan into the mix… that takes a lot of talent. These look awesome! these look delicious! They might rival the vegan brownies served at UBC (pretty much the best bought brownies I’ve ever had, vegan or not!). These look beyond amazing! Major kudos to you, I can only imagine *how* hard it is to master a vegan brownie recipe AND gluten free vegan. Can’t wait to try these out! Definitely book-marked :) And thanks for the gluten- free option, super tough to create indeed! Awesome!! Now if you cube them, and put them on kebab sticks with fruit and drizzle with chocolate OMG…. I blogged about these awhile ago, they are insanely good – and go over VERY well at parties!! Painfully gorgeous and drool-inducing post! Gotta have the crispy crust on a chewy brownie. I agree cakey is for cake! : ) Can’t wait to give the gluten-free version a try (no gluten for my autoimmune diseases!) Also wanted to let you know I visit often just to “ooooh and aaaahh” over your beyond gorgeous photography. Awe-striking! these brownies look amazing. 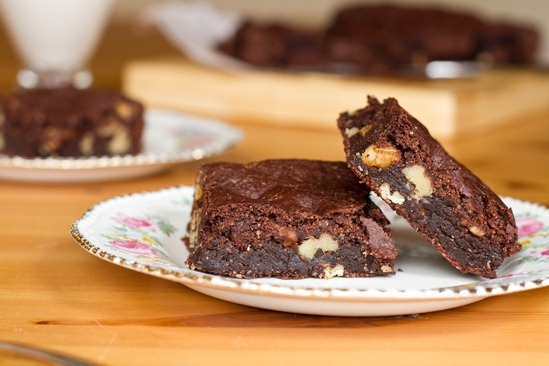 I never used to like brownies because they are too dense and sweet but these versions look great. I prefer them hot with a scoop of vegan vanilla ice cream on top. yum. ahh the elusive flaky topped vegan brownie!! i know what you mean about wanting a crispy crust. i too have tried many vegan brownie recipes and they tend to end up either cakey or fudgey and more like a torte- which i love but simply they are not then ‘true’ brownies. these however look like the real deal….!! Thanks Angela! I have to make these for my Vegan friend. She doesn’t know how to cook or eat and she’s Vegan. I’m not, but I always bring her meals I know she can eat! She is shocked sometimes by the fact that something is vegan and tastes so good! Thank you!! They both look amazing, nicely done! Mmm brownies are the best! Yum. Angela these look fantastic! I must try them when I get back from Florida! <3 fudgy brownies!! Yay! So glad to see you did a gluten free version! I’ve been moving from vegetarian towards vegan (it a short trip…dairy doesn’t agree with me that well anyway;) and LOVE your blog!! Oh my…these look amazing..can I get one now…it’s ok that it’s 7AM..I still want one..I lie…more than one…delicious looking! Ooo, I love brownies! Not a fan of walnuts, but I’m sure they can easily be omitted. Can’t wait to try this!! Oh my gosh I could just take a spoon to that bowl of batter and go to town. It looks INCREDIBLE! Wowee, thank you so much for doing all this difficult research! A good brownie is indeed hard to find, but I have a good feeling about these ones. I also love a good crispy crust on a brownie – that’s the best part! On another note, I used your recipe for a carrot cake smoothie for breakfast this morning and it turned out amazing! Thank you! Cannot wait to try these! 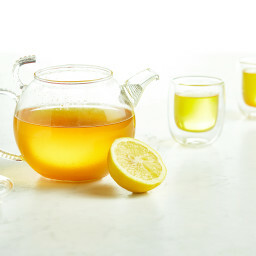 What would you recommend i use if I want to decrease sugar levels (substitute that would work well in place of sugar)? Thank you for setting us up with a perfect brownie recipe for the weekend:-). I’m dreaming of your brownies paired with a salted caramel latte! 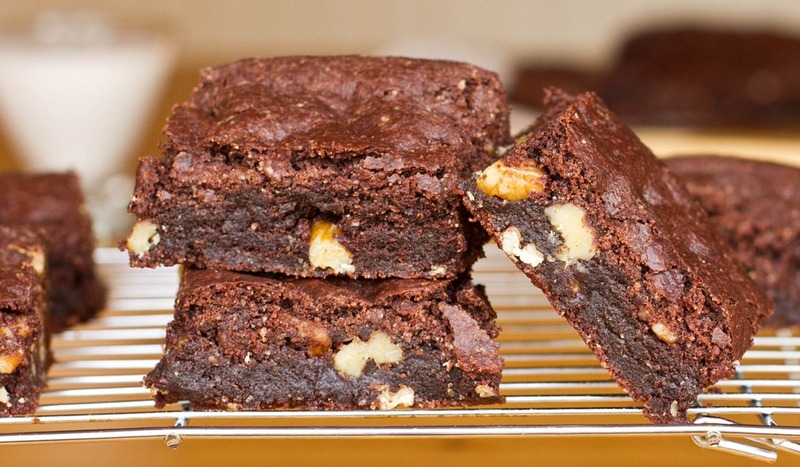 These brownies look great, I can’t wait to try making them! I would either a: just eat the batter or b: just eat the edges!!! I’m crazy over fudgy brownies! One of my very favorite desserts. Actually, I just posted about pumpkin brownies in celebration of autumn and chocolate. :) Delicious! These look heavenly. These look so delicious. I seriously cannot get enough almond flour in my gluten-free baking, what a super incredible ingredient it is. I bet these would be good with a little sprinkle of coffee, too. These look awesome- especially the gooey looking one on the left. Can’t wait to try them. Just wondering, if these were to be a vegetarian, GF version, would I just sub an egg for the flax/water combo? They look delicious, btw. Thanks! I have a great healthy brownie recipe, and I sub’d the flax egg or a real egg and it worked out perfectly! Check it out! I would love to try these, they sound, look, and (duh) just have to be amazing! Love your ingrediants here. I can’t thank you enough for this! Brownies are my FAV but buying healthy versions is so expensive and the texture usually isn’t quite right. I’ll be making this for the holidays..and probably a lot of days afterwards. Thanks again Angela!!! These look amazing! I can’t wait to try them. Thank you Angela! These look so delish – I might try to throw another element in there and make them naturally sweetened. I’ll let you know how it turns out! (I don’t need gluten-free so would probably just do this with the vegan version). Brilliant! Just made them this morning. The recipe was easy & they’re moist and delicious! My husband and I will enjoy them before AND after running a race this weekend. Thank you so much! Yum! I was actually brainstorming some vegan brownie ideas the other day. Brownies are my favorite and so far every “healthier” version I have attempted didn’t quite turn out. If my kitchen experiment doesn’t turn out I know whose version I will be trying! YUM! Brownies have to be one of my favorite desserts of all time. While I won’t “ruin” them by adding nuts, I’ll certainly eat the nuts on the side ;) Thank you so much for sharing your failures as well, makes me feel better about all of my kitchen mistakes! drool!!!!!!!!!!! That looks so fluffy and delish! yum! I will have to omit the nuts for the bf. According to him, chocolate and nuts don’t mix :) Now that the temps are getting colder it is baking season again! Oh my gosh! I’m making these this afternoon for my kids and their friends…if I make it for a bunch of kids then I’ll be less likely to over-indulge myself!! This is such a bright idea! Thank you! These look delicious! I have yet to make vegan brownies with that flaky top that conventional egg-containing brownies can have. I’m excited to try one of these recipes. 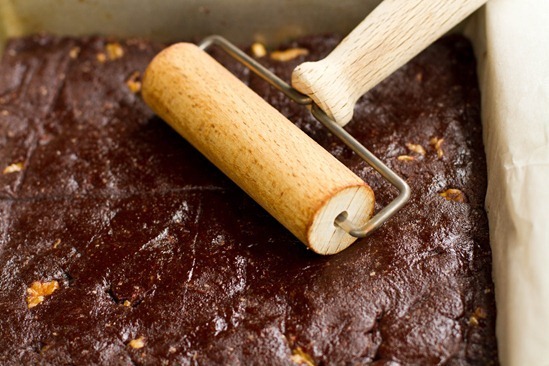 Where can I find a pastry roller like yours? I’ve only seen them with handles on the sides which doesn’t help for smoothing bars and brownies out in a pan. These look so moist and fluffy. I have not had good brownies in a long time. 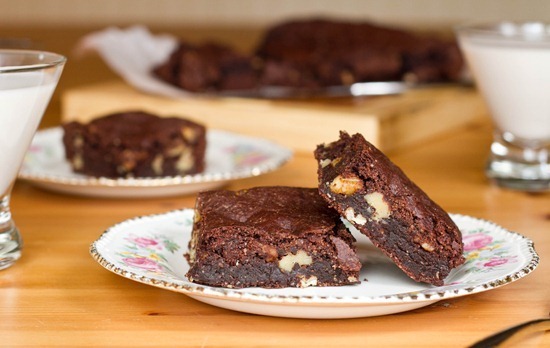 Oh my, I have had brownies on the brain for days now and was so happy to see you make some brownie recipes. They both look great but I am going to go with the vegan version. Thank you. Thank you. I will take all 3 please. :) At first, I concluded the GF only because it was bigger. ;) But they all look very delicious. How fun to do a blind taste test with brownies. I made the GF ones today. These look absolutely mouthwateringly delicious. As soon as I get out of the hospital I want to make them!! Maybe I’ll have my sister make them and bring them to me. Her best friend has celiac and loves vegan goodies so I’m sure they will be eager to try them! I just made a variation of these, substituting the cup of sugar for half a cup of brown rice syrup (decreasing the amount of milk as well), and the Earth Balance for coconut oil. If anything, I thought they’d be too moist and batter-y, but they turned out really cake-like and sort of bitter. I’m not blaming you at all, though, Angela – obviously I should have listened to you! Consider this more of a warning: don’t mess with Angela’s recipes. They’re good as they are. I tried making with agave and increased the flour. A little too dry, but great with cicnut ice cream! p.s. 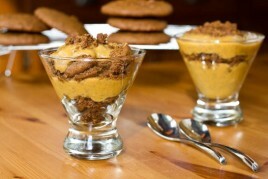 what are your favorite Vegan desserts to make for the holidays? I’m trying to brainstorm ahead of time. Things get crazy with little kids. These look absolutely delicious! Im not vegan or GF but I would love either of these :) They look great! Brownies looks so good! My hubby’s bday is tomorrow…mayhaps I will whip up some for him! I’m going to make these for my boyfriend to show him that vegan food can be yummy food!! thanks Angela! If only I ate chocolate. Nevertheless, I’m so glad you posted both recipes, and with more than just a little bias, I’m glad you preferred the GF/V version in the end. And even though I myself don’t eat chocolate, I know a lot of my GF, DF, and V friends who would do anything for a delicious chocolate brownie. Will definitely be making these for them this holiday season. I have been looking for gluten free + vegan brownies for sooooo long. Just a quick question: are you using alkalized cocoa powder? I’ve never seen pastry rollers like that, wonder what could be used instead of it? Probably would be ok if it was just patted down with the back of a spoon? Made the gluten free last night: A+! Finally got around to making these brownies – first batch were exactly as the recipe (non GF) and were delicious. Made a second batch where replaced the earth balance with 1/2 mashed banana, increased the choc chips by 1/4 cup and used Stevia instead of sugar. Was good – just a little bit more ‘cakey’ but still moist and yummy. I’m off to make your Perfect Burgers again today! Can’t wait to try this recipe!! I just made your vegan all purpose flour brownie recipe and followed it exactly; however, they kind of crumbled apart. The batter looks just like yours, thick and wet. Tasted amazing too, but once they were cooked and cooled and I cut them they crumbled apart everywhere! What could I have done wrong? You made the SparkPeople’s “This Week’s Healthy Headlines” again! I just made these brownies tonight and they are a new favorite of mine. They did take awhile to make and it took over two hours to cool without crumbling, but they are more than worth it!!!!! I swear, you should definitely write a cookbook one day and include this recipe. 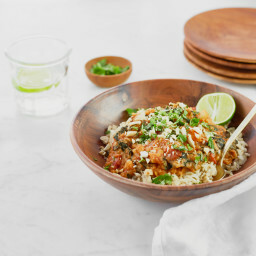 These recipes are certainly worth the price, however I can also see that it can be even more rewarding to share your recipes when their isn’t a monetary value attached to them. I picked that up in my psychology classes, as I’m sure you did too ;). :drool: working backwards on your posts (haven’t been here in a while) and I regret not popping up more. must make this brownie this weekend!! Do you have the Nutritonal info> of course id use whole wheat flour. No I’m sorry I don’t have the info. 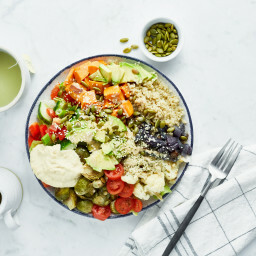 I believe you can find the nutritional data by adding the ingredients to http://nutritiondata.self.com You have to register to the site and you can create an analysis of the ingredients. i made these and they are so good! i made sure to follow the directions just right but my batter was way too easy to stir it wasn’t as thick as yours was in your pictures…any suggestions? i ground my almonds and they seemed kind of wet, could this have been my problem? It sounds like you may have over-processed your almonds? If you process them too much they will release oils….not sure if that would be the reason or not! Did they turn out? Made these this afternoon and let me just say OMG!! The batter was lick -a licious and the brownies…………..HEAVEN! The only thing was my bottom of the browies didn’t get hard, it stayed gooey, but they were heavenly. I cooked them in a glass 8×8 dish. I made the regular vegan version!! Hubby said he would like them a little more cakey, but that they were fabulous. I ate two and the second one was a bit too much. VERY rich and yummy! Thanks!!! I have been a quiet follower for the past two years! I absolutely love your site! It is wonderful! I was thinking about making your vegan brownies above and I wanted to incorporate coconut flour, any suggestions how I could substitute this into your recipe? Would I replace the all-purpose flour with coconute flour, same amount? Hi – I made these brownies and they tasted nice but mine ended up being so dry! I didn’t even cook them as long as was suggested but they tasted like I had cooked them forever. What is the best way to counteract this? More Nature’s balance? Less cooking time? Or maybe both? The crust is supposed to be firm and flakey with a soft middle (but not super gooey though). You do have to let the brownies cool for 60-90 minutes in the pan after they come out of the oven…this part is essential for them to set. I made the vegan version for work, and needless to say, everyone LOVED them!!! It was also fun to surprise skeptics with the info that they were vegan, after they had tasted them. I substituted a flax egg with a chia egg, and all-purpose flour with whole wheat flour, b/c that is what I had on hand, and it worked well! Looking forward to making these for Thanksgiving, as well as some of your other delicious recipes! Thanks! I’ve been cooking and BAKING vegan for over 15 years now and while I’ve recreated nearly every non-vegan dessert I could think of, I never had the patience to come up with the perfect vegan brownie. I’m so glad you’ve done the work for me! I am greatly lookig forward to making these. They look fantastic. Thank you soooo much for this recipe, they are sure to be a hit! I made the vegan, gluten-free brownie and put in a can of pumpkin puree. It came out incredibly moist. I regret having to use the brownie mix from Trader Joe’s instead of buying the individual bags of dry ingredients (arrowroot, brown rice flour, xanthan gum). It still came out quite good, however I didn’t put the vegan chocolate chips. I was ready to buy it at the store, and to my surprise — they had dairy in them. So I omitted the chocolate chips from the recipe. In hindsight, the chocolate chips would’ve made the brownies sweeter. The cocoa powder, vanilla, and agave sugar (as well as the organic cane sugar in the brownie mix) gave it that chocolate taste, but it was very slight. Lesson learned. I’m definitely going to experiment next time and measure the ingredients according to recipe. And of course, throw in a “mystery” ingredient or two. Ever since I started baking these brownies, I began to take an interest in vegan/gluten-free foods. I surfed around the web, reading blogs about vegan cooking, then researched a similar ingredient used to replace xanthan gum and arrowroot — agar agar. It’s used as a thickener. Keep up the great work Angela! I love your blog! I definitely will try some more of your recipes. Hi Karen, Thanks for your comment! Im glad you are having fun playing around with the recipes. Do you have nutritional info for these? Just curious how they compare to regular brownies. Hey Rachel, Im so happy you enjoyed the brownies! Thanks for letting me know. They are a fav around here too. 1.5 hr cool time—booo!! I will do it though;) For a chance to try a perfect brownie perhaps?! I had some leftover BAD sugar and bread flour that I couldn’t stand to just throw in the trash so I used a bit in this recipe and then some brown rice flour. Hopefully it works out well! Hi there! I baked the vegan version last night and they were mighty crumbly! As you chewed them they became more gooey, but hard to handle initially. The only thing I didn’t get perfectly was the almond meal. I happened to have a boat load of almonds on hand and decided to try it out. I was worried they were becoming buttery (kind of turning into little balls) so I just threw it in at that point. I was doing short bursts and everything with my food processor! Any tips on how to make these more moist initially? These brownies are very crumbly if you remove them from the pan & cut before they have fully cooled. I find they need a good 1-2 hours in the pan or longer, then they are fine for me. Also, if the meal isn’t completely ground up that may have impacted the brownies too. I hope you have better results if you try them again! Wow! I made these tonight to bring for a dinner and they totally outdid my expectations. I’m not vegan, but these are my new go to brownie recipe. I’m going to try very hard not to eat the few I have left tonight. Thanks very much for the recipe! I am amazed! They look and smell and (from a tiny crumb I stole) seem to be the real deal. A little nitpicking, though. The ingredients list could be more specific and call for chocolate chips rather than just “non-dairy chocolate”. Obviously chips are needed as in step 4. Also, in step 3, directions should say “add 1/2 cup of chocolate chips” rather than just chocolate. I’m baking these right now! But mine are pretty liquid-y, not dry. Is that bad? Or is it because of something like high-altitude? hmm it could be…did you make any changes to the recipe? Let me know how they turn out! These are fantastic! We did the gluten-free, vegan ones. We are on our 3rd batch in a week! Made a few subs: didn’t have rice flour so did Bob’s Red Mill GF flour (your recipes are so flexible I figured it wouldn’t be a problem), a little less cocoa, baker’s dark chocolate and used only 1/2 cup, and no canola oil because research coming out bad for body and thyroid. These are the best! Thanks so much Angela! I made these today for my whole family for Sunday dinner. They were a huge hit! My family is not vegan diet friendly, but these may tip the scales :) thank you! All right, found my baking experiment for the day!!! Been dying for a good gluten-free vegan brownie! These were the best brownies I’ve ever made – vegan or non-vegan – but I used a glass baking dish and easily doubled the cooking time (they still came out a bit raw). I added crumbled candy cane instead of nuts and it was devine. im so happy to hear that! Brownies are what I’ve had the most trouble with since going vegan too! I’m going to have to try your recipe. My most recent batch ended up as brownie pudding! Hi. I just made this recipe. The brownies are in the oven. But the dough was not hard like in your pictures. The only different thing I did, was melting the butter and chocolate chips on the double boiler ( a don’t have a microwave). Do you think I did something wrong?? Thanks. 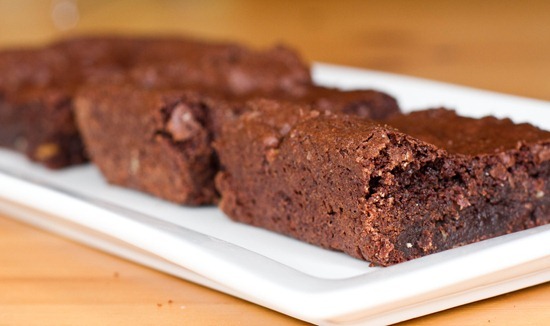 These brownies are seriously amazing. I made the gluten free version and they are so moist and dense and just about perfect. They have a great, crispy top as well. I pretty much can’t make them or I’ll eat the whole pan in a few days. I haven’t been disappointed by one recipe I’ve tried; for someone who is gradually transitioning into a more plant-strong diet, I cannot tell you how nice it is to have confidence I’m going to like any recipe I try from this blog. I also love your photography. Yum! These are very delicious! So satisfying! Will have to try the GF version next time. Everything Nicole said above I second. GF version is moist, dense and comes out picture perfect everytime. 35 mins. and perfection. These brownies are a staple at our house. All of your recipes are always so forgiving of substitutions which we greatly appreciate. We made them with Bob’s Red Mill All-Purpose GF flour and they cut easily 10 mins. after taking them out of the oven. May be difference between brown rice flour and Bob’s Red Mill GF flour. We also didn’t use the walnuts but that probably doesn’t make them crumble when warm. They really are lovely fresh out of the oven. So thankful these don’t have ingredients like xanthan gum or fake egg replacers. My daughter thinks you are terrific. If you can come up with a vegan, gluten-free, gum-free pancake without funky faux ingredients, she will be eternally grateful! Oh wow, I can’t wait to try the gf version. I have been vegan for just over a month but just this week started to suspect that I might be intolerant to wheat. Yay, brownies! Currently eating one of these with a scoop of swedish glace vanilla soy ice cream on top :) heavan! can you use a replacement for the earth balance ( reduce or elminate fat) such as applesauce? These are the best brownies ever! My only alteration is to use whole wheat pastry flour insetad of all purpose. They are dense and wonderful! Thank you for such a great recipe! I just made these brownies today – SOOOOOOO Good! Thank you so much! Hi Angela! I’m a long-time follower of your blog and try lots and lots of your recipes. I am also a newly awakened vegan (the past month or so), and vegetarian of 1 1/2 years. I just wanted to say that I’ve tried several vegan brownie recipes, and like you said, most have turned out kind of “cakey.” If I want cake, I’ll make cake! I love a brownie to be thick and dense and fudgy- something to really sink your teeth into! 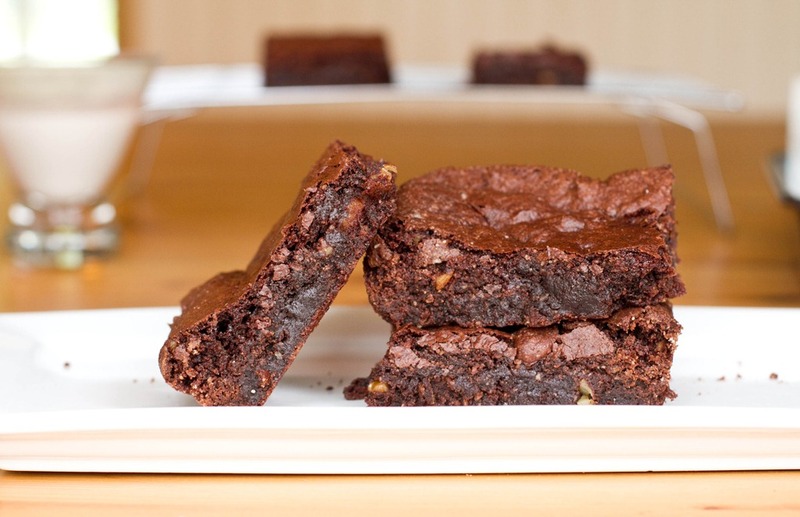 I made this brownie recipe (not the GF) last night and OMG… they are SO amazing! I’m a chocoholic, and I was in heaven! This morning, I’m indulging my chocolate whims with your chocolate cake batter smoothie recipe, and half a brownie crumbled in. Wowzas. YUM! Thank you for your wonderful recipes! I can’t wait for your cookbook to come out! Sweet Jesus, these look amazing! I can’t get Earth Balance, would coconut oil work? I haven’t had brownies for so long. I’m doing the gluten-free version right now, with walnuts and pistachios in a cupcake pan. I’ll come back later to tell you how it went! I was so scared to try these vegan brownies, but the recipe was so simple and they are delicious. posted a picture on facebook. Once again thanks Angela your just amazing, you are really gifted. Just made these brownies today and OH MY!!!!!!!! They are awesome!!! These are the first Vegan brownies I have tried that have turned out beautifully! Definitely a keeper. Also may I just say that every one of your recipes that I have tried to date have turned out wonderfully and have tasted equally as amazing! I have been following your blog for some time now and I am so inspired by your story and by your great recipes that I thought it was well past time that I thanked you for sharing all your recipes and encouragement on your blog. I just tried making the vegan version. I was really happy with the consistency but I found the almond meal took over the flavor. Is it possible that I could get away with substituting whole wheat pastry flour for the almond meal, possibly changing the amount if need be? And I use EnerG in place of eggs rather than flax meal, how many “eggs” should I use with this recipe? Have you tried the gf brownies with a non-nut flour? With one daughter gf and another nf, it’s hard to find one both ways. This recipe http://ohsheglows.com/2011/10/19/vegan-brownies-two-ways/ says it’s vegan but then you say in step 3 to mix the eggs in. Yikes! Best brownies I’ve ever had. Made them for a healthier brownie recipe and I loved them! Thanks Angela! I made the GF version for a work gathering that included GF and vegan folks but I think I overbaked them slightly as the edges were pretty hard and sandy. I cut them off and saved them to crumble over ice cream later. The finished product was still a little dry and sandy for my liking so I made a quick icing with 1 Tbsp earth balance, 1 Tbsp cocoa powder, 3/4 C powdered sugar and 1 1/2 Tbsp maple syrup then used a piping bag to make rosettes diagonally and decorated with a light dusting of icing sugar. The creaminess from the frosting was quite nice and the decorative finish really took these up a notch. Hi there! Great recipe. Though I’m about confused about the parchment paper. Do I leave it on during the baking process or remove it? Yes you leave it on during the baking process. Enjoy! I tried the first recipe a while ago and it was amazing. The batter is definitely strange, but I was so tempted to eat it “raw” it was good! I’m often disappointed by brownies because they taste more sugary than chocolatey but these ones had wonderful chocolate flavour! thanks. I made these last night and they were amazing!. I didn’t have enough cocoa powder so i added some shredded coconut in with the mix to make sure the texture wasn’t too runny. It worked really well together. Great recipe. Thanks so much for posting. I made these (vegan version) brownies two hours ago and I can’t stop eating them. I didn’t have AP flour so I used whole wheat flour and made my own almond flour. I omitted the walnuts (brace face) and added butterscotch pieces and this was simply amazing. Moist and fudgy. My favorite vegan diner makes the worst vegan treats so I had to give this one a try and I will definitely make this one again and again. THANK YOU FOR THIS AMAZING RECIPE. I have recently started a GF diet and tried this twice with a few variations, it is so awesome! Thank you. May I include this in my blog, including the link to your webpage? Glad you enjoyed it! 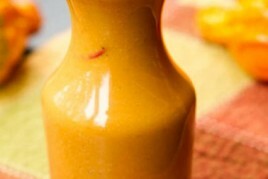 Yes, you can link to my post and use a picture if you’d like (with credit) but I don’t permit re-posting of my recipes. Hope this helps! yes, that is what I was going to do. thanks! 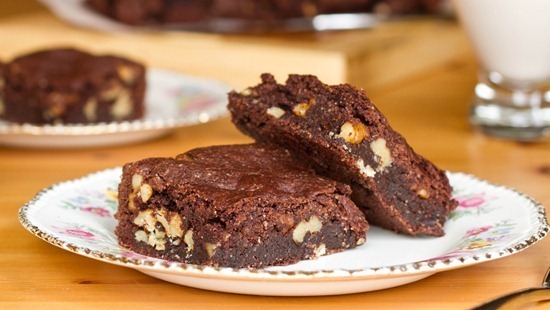 I just made these, I used almond-rice milk, for the rest I closely followed your recipe and the brownies turned out AMAZING! Thank you so much, I am trial baking for my family Christmas dinner next week and will serve them these brownies, thanks! One question: do you think you can use Chia seed ‘eggs’ instead of flax eggs? They might have a less distinctive taste I think… Did you ever try that? Hi Angela, these look amazing! I have a question, is there a reason 1 cup of almonds = 1.5 cups of almond meal? I’m still quite an amateur baker. Thank you! Thanks for the recipe. I tried making the Vegan+GF recipe and sub the flax seed egg mixture with applesauce. They didn’t rise that much, which makes me believe that I should have added the flax see egg instead. Have you tried making these with applesauce? I made these for an engagement party and people devoured them like they were water in the desert. THANK YOU! I doubled the recipe and cooked it for a little longer in a bigger pan, and I think the thicker brownies may have made them even better. I also doubled the vanilla and added a small amount of coffee grounds to the chocolate. Oh, and I didn’t use the pastry roller. They may not have been as pretty but it didn’t hurt the taste at all. Thanks again. Great recipe. MMM! The BEST brownie I have ever tasted :)! The Texture is perfectly moist but also somewhat cake-y. Absolutely a new favorite! Hi! These look amazing. If I want to swap out part coconut oil part applesauce for the butter, do you think that would work? I would do half and half. Thanks!! I can’t find my ground flax but I do have egg replacer. Did you try the brownie recipes with egg replacer and how would you advise if that’s all I have for a leavening agent? I made these over the weekend to take on a camping trip. BEST IDEA EVER. They were a hit! I added a bit of instant espresso powder and used chocolate bars with espresso beans in them instead of regular chocolate chips and they were perfect for my coffee loving group of friends!! Thank you for sharing this magical recipe with us! Made these tonight and they turned out great! My batter wasn’t THAT thick. Not to the point it required me to roll it out anyway. They are everything a brownie should be, chewy, chocolatey, delicious. And pretty easy to throw together! Thanks so much for a great recipe! I love this recipe! It is my favorite brownie. I would appreciate it if you didn’t yell, though. It makes the stress of baking that much more difficult. Other than that, great work! I bought your cookbook (which is AMAZING, by the way) and there is a similar recipe (maybe the same one?) in there and I have a question. It might seem obvious to most but I was wondering if you leave the parchment paper on top while baking. At first I thought no, but when I tried to remove it a ton of dough stuck to it so I put it back on and left it in. I know you did not say to take it off but in some cases, things are too obvious to mention and so now I am torn whether you meant to leave it in (because you didn’t mention to take it off) or didn’t mention it because it is obvious that we should take it off :-). These look amazing! I was curious if you have ever used coconut oil rather than Earth Balance in your baking? I am trying to avoid products that contain palm oil and I was curious if you’d tried it. its working now – recipage must have been down? I’m from Germany and have been reading your blog for quite while. I love how you don’t simply try to create tasty vegan food, but also take the healthy aspects into consideration. 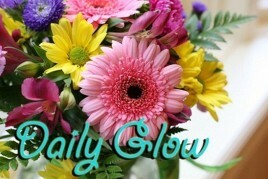 Combined with your sympathetic way of writing, your posts are so much fun to read! This recipe was my second try – I still need to get used to measuring in cups instead of weight – and now I feel like: Oh my god, these brownies are by far the best ones I’ve ever eaten! Usually I like the taste of my baking attempts, but the texture almost always needs improvement. However, as you already wrote, these are simply perfect in every way. I merely replaced the walnuts for dried cranberries, so that the brownies get a fresh touch. Could you tell me how many calories are in one serving of this please? My family really loves these brownies. I made the vegan and gluten free version and it turned out perfect! Thank you Angela for putting together such a wonderful recipe! I happened upon this site quite by accident and even though our family does eat meat, we are looking to reduce our dependence on animal products. I had no idea you could replace using an egg with flax and water. How ingenious! Do these brownies freeze well? Thanks! OMG, Just made those and they are addictive! thanks so much :) as always, your recipes are a HUGE success! Thanks for the recipe. It is my second time making them and we love it. So far the best vegan brownies I’ve made. Oh my, I went from the cookbook, and I thought the batter was way too dry. So I added a couple of TBS of almond milk. We shall see what happens, they are cooling. I wrote a note in the book! How do you know when the brownies are done? And did you bake with the parchment paper on top? Love the book, people at work could not believe how great my “funny” food tasted! Starting at a new school, so I have all new people to mystify! I made the brownies out of your cookbook yesterday for the second time. The first time turned out pretty good but were still a little dry. Then yesterday they came out dry (even though I followed the exact cooking time) and were a little bit like cookies. Is it possible that when I mixed my almonds into flour they were not flour-y (inventing words;)) enough? or could the fact that I didn’t have enough parchment paper to roll on top have done anything? They still tasted delicious despite the fact that they didn’t taste very much like brownies though! I got the recipe from the cookbook as well and they came out dry as a cracker and hard. The book measurements must be off. I made this this weekend and they came out amazing!!! They have a wonderful slightly crispy outer layer and are fudgy and delicious on the inside. Not one person said they would have ever guessed that they were vegan!! Score!! = ) I didn’t change anything and they came out great! This will definitely be my go to vegan brownie recipe from here on out!! Thank you so much!! I made the gluten free version and they’re seriously the best brownies I’ve every had! I gave basically the whole pan away, so I’ve made them again this morning to enjoy with family :) They’re so rich and I love that they’re not too sweet. Just one cures the craving for brownies! Thank you!! Hi Angela! I am hoping to bake these for my mom’s birthday tomorrow. I was wondering if you have ever made your gluten-free brownies with homemade brown rice flour. I was contemplating just using my Vitamix’s dry pitcher to turn brown rice into flour. Think it would work? These are incredible! 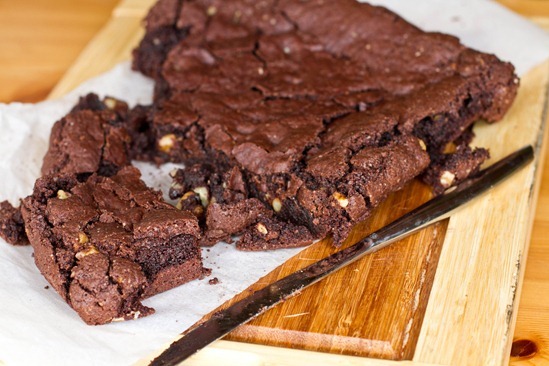 Until now I haven’t found a single vegan brownie recipe that has that flaky crust on top- what do you think is responsible for it? It is critical to my brownie eating satisfaction! I followed your instructions except had to use about 1 cup turbinado sugar bc I ran out of white sugar, and I doubled the amount of nuts as mix-ins (love extra nutty brownies so I couldn’t help myself). They came out awesome- perfect flavor! Texture was a little crumbly but I think if I had a pastry roller to press them down like you did that would have helped- I kind of got sick of fussing with spreading them out in the pan and just threw them in the oven so I take the blame on that one :) I made sure to let them cool completely to try and make up for it- ha! I know you introduced a recipe rating system but I don’t see a way to rate these…? I would love to try baking both but I was wondering if the GF version would require some Xanthan Gum. If so, how much will it need? Hi, I was wondering if I could replace the cane sugar with sgave or maple syrup? Thanks. Hi Jenna, Swapping a dry sugar for another dry sugar is usually fine, but if you want to sub a dry sugar for a liquid one (such as you suggest here), it gets tricky because it throws off the wet/dry ratio in the recipe. For that reason I would not recommend it, unless you are fine with getting a different result. Hope this helps! Made the vegan recipe and was delish! 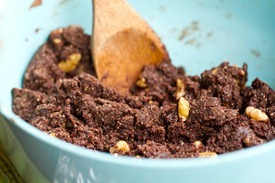 Want to make again, but sub in more chocolate for the cocoa powder. Should I add more flour, to balance out the dry/wet ratio? I made the gluten free version of these brownies. I dont know what I did wrong but they came out so hard, almost like a thick chocolate cracker. When I went to use the flax seed egg that I set aside it almost looked like oatmeal that was left out for too long. I dont know if that made a difference? Did anyone else get this result or know what I might of did wrong? Can I use coconut oil instead of earth balance? I was wondering is your batter pretty dry when you mix it all up? I’ve tried it 2 ways. The first time i tried i guess i added more milk than required and the batter wasnt dry but the brownies turned out nice and chewy. But while they were baking i started making a second batch cause i was worried they werent gonna come out right cause the batter wasn’t dry. I just made the regular (non gluten free) version and they’re good! My fiance loved them. I used white whole wheat flour and left out the walnuts because I’m bringing them to an Easter lunch with picky eaters. I also doubled the recipe and baked them in a 9×13 pan. Ended up cooking them about ten minutes extra because they are a little on the thick side and seemed really jiggly. Thanks for the recipe! Divided means that I don’t use all of that particular ingredient in the same step. Hope you enjoy! Hi Angela, this recipe looks great. Could I use all purpose flour or whole wheat flour in place of the almond flour/ almond meal? Thanks! Just put them in the oven! I didn’t have parchment paper- I’m hoping they still bake fine! I bake egg-free, per my son’s food allergies. I can replace eggs with flaxseed with success, except for brownie recipes. I use AP flour and butter for brownies, and the butter separates from the batter, as it bakes, leaving the brownie swimming n liquid butter. Do you have any idea why? I wonder if I can take this recipe and use AP flour (He’s allergic to tree nuts.) and butter, with success. Hi!! 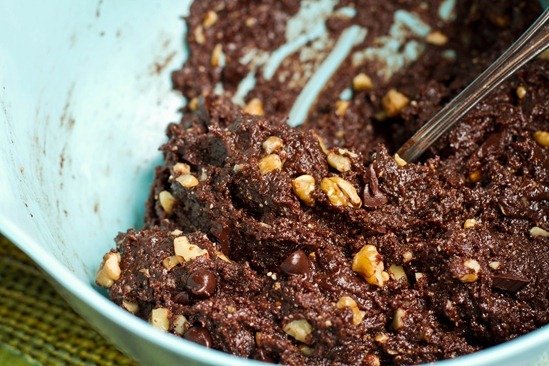 Can you make these with cacao nibs instead of using the non-dairy chocolate? Or would the brownies turn out to be more bitter? Thank you!! The GF brownies came out great!! 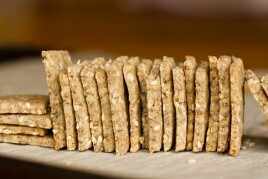 I love the texture, its so dence and chewy I could cry a happy tear! I let them cool uncovered overnight, and will be sharing with family after dinner today. Next time I would like to try oat flour in place of rice flour to see if they are equally successful. Thanks Angela, I can always trust your recipes. Great recipe. I love your work!! any suggestion for replacing almond meal/ flour? I know it is all the rage, but I am allergic to almonds. I bought all the ingredients to make these tonight, as my first foray into vegan cooking, but what is “flax egg”? Thank you very much. Made these today.. and they are awesome. Did not make the GF. My daughter has a new found allergy to cane sugar. I have been substituting coconut sugar 1:1 for cane sugar in most recipes and it has worked out so far. Will coconut sugar at this ratio work for this recipe? Do I need to change the ratio? I am thinking I need to up the amount? Also, your book says to bake these in a 9″ square pan but it looks like you baked them in an 8″ square pan here – which do you recommend? Lastly, do you think any other non dairy milk would work or should I stick with the almond milk? Thank you for your response in advance – I have had great success with every recipe of yours that I have tried until this one. The changes I made are the coconut sugar for cane sugar, rice milk instead of almond, and I used an 11″ x 8″ pan. The brownies turned out dry and quite crumbly. OK, I admit it, I forgot the extra 2 tablespoons of butter but do you think that was the difference. PLEASE HELP!!! Hi there, I’m sorry to hear your brownies didn’t turn out! Coconut sugar is drier than cane sugar, and it can often result in poor outcomes if swapped into a baked good recipe (depending on the recipe of course! ), so my guess is that this had a big influence on the outcome (as well as potentially leaving out the butter). Usually swapping one plant milk for another is totally fine, so I don’t suspect that is what caused it. I hope if you make them again, you have great success! Also, keep your eyes peeled for my new brownie recipe in the next cookbook (it’s gluten- free and grain-free!). Thanks for your response, Angela! What do you think about adding maple syrup, agave, brown rice syrup, or something similar in addition to the coconut sugar? Would that help moisten up the recipe for me? If so, any recommendations for how much to add? Thanks in advance for your help! I made the recipe from the cookbook (which is quite similar) with coconut sugar and it was very crumbly, similar to your results. It could have been the fact that I use raw cacao powder, so I’m not really sure. It’s your call. Usually, you can substitute a liquid sweetener for another liquid (such as milk or water) in a recipe. 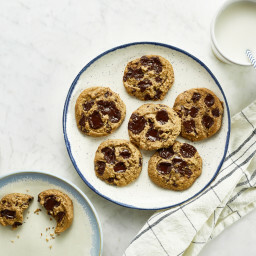 If you simply add a liquid sweetener, you off-set the balance of wet and dry ingredients and the flour may not be able to “drink up” the extra liquid, resulting in a gooey or gummy texture. Hope this helps! Thanks, Annalise, i haven’t tried anything yet but the next time I experiment with this recipe I will post my findings. hi,do you think it’ll work if i swap almond milk with soy milk? Hi Marilyn, I don’t have a conversion done – sorry! But there are definitely a few great (and free!) conversion calculators online that should be able to help you out. An ingredients-based one like GourmetSLeuth’s is your best bet for accuracy, since it will let you take into account those differences between ingredients. Hope this helps! Living in Asia meant it has taken me a while to gather all the ingredients for the vegan and gluten free brownies. But to my horror, the link to the vegan and gluten free brownies does not load for me anymore :(((. Could anybody help? I just made these in practice for my sisters wedding and absolutely blown away!! Gave some to my very “I-could-never-be-vegan” housemate and she loved them! Said she couldn’t believe they were completely vegan :) Yay! Looks amazing!! Have you tried subbing in coconut flour instead of almond? I read usually 1/4 cup is equivalent to 1 cup of almond flour, is this true? Can’t wait to try out the recipe! Super! The edges were soooo chewy perfect. Makes one of those snake shaped brownie pans seem like a kitchen necessity! I have made these brownies so many times since you have posted this recipe Angela, I haven’t made the gluten free version because I don’t have a gluten intolerance and don’t care for most gluten free recipes (though I am sure they are delicious). These are the MOST DELICIOUS DAMN DARN VEGAN BROWNIES IN THE WORLD AND ARE ABSOLUTELY PERFECT!! I have served these up to family and coworkers and my husband (who reallly mostly despises chocolate) and have created a small fan base asking for the recipe and to be harassed about bringing them around more often. I recently didn’t have any almonds/or almond flour and used walnuts in place, they did come out a little more oily than normal but were even still amazing and I was even told they were better than before. Thank you for your glorious brownie recipe and all the loveliness you bring Angela! I made these brownies in a cast iron skillet. I only cooked for 25 min and cooled on the counter with a window open just a crack as its 0’C outside. 1/4 inch of the outside hardened to make a nice lil crust and everything beyond was moist, dense and delicious. Hi thank you so much for the recipe! All my family and friends love this (of course including me)! I just have a question… I did leave the brownie (the vegan one) in the pan for more than 1.5 hours, but they still fall apart like sand with some water. Therefore it’s a little hard to share it with people other than close friends and family. Any suggestions? These are THE BOMB!!! So fudgy and rich. Make these now! I agree. These (GF) are my go-to brownie recipe. Making them tonight for my book club. Will eat any left-overs for breakfast :) Thanks for the recipe. “These are the best brownies I’ve ever had.” – Direct quote from my mother… twice. These are unlike any brownies I’ve ever had before. Most recipes use unsweetened chocolate, but the cocoa powder makes them taste almost like chocolate icing! With mediterranean sea salt, it was the perfect combination of sweet and salty, and they baked perfectly all around (no gooey center)! If you use an 8×8″ pan, I’d reccomend baking it 3-4 minutes longer. I might regret saying this, but these beat my family’s traditional brownie recipe into the ground. SO delicious. Also, my sister keeps sneaking into the kitchen to grab more, and I have to yell at her to leave some for the rest of us. Link broken? Hello! I love your GF version (best ever!) but the link to the full recipe for some reason today isn’t working. So sorry about that! This recipe is in the old Recipage database and it’s been loading very slowly lately. We’re in the process of transferring recipes, but it’ll take some time. and give it some time to load (it’s slow)? In the meantime, here is the recipe copy and pasted, just in case! Dense, nutty, with a crispy crust. Our favourite vegan brownie to date and gluten-free too. No one will ever guess these are vegan and gluten-free! I have made the vegan version about four times in the last few months….everyone loves them! But I tried to click thru on the link to get the full recipe so I can pin it, as a short cut. The page does not load….quite the bummer. I tried several times. ooops, I did not see the previous. I will try again. Yes, it loaded. I hate losing track of good recipes! Thank you! Have a great holiday! That’s great Sue..thanks! Have a great holiday! Hi, I’m so looking forward to making these brownies but first would like to check the weight of the chocolate …do you have this in grams please as I can’t figure out how much should go into the cups. I work in grams and am just not used to cups :) thank you!!! Happy to help! You’ll need around 90 grams of chocolate for the 1/2 cup measure, and around 40 grams for the 1/4 cup measure. Hope this helps. Hey Dena, Anytime! About the books, the second book (Every Day) has more desserts. The first book has one cookie recipe, while the second one has a cookie chapter. But there are some dessert gems in the first book too (the chocolate espresso torte, raw pumpkin pie to name a couple). I hope this helps! Happy to answer any other questions too. One more question please …when measuring up the Earth Balance (or other), do you need to melt it to measure it?! Good night Angela. Love everything that you’re doing. The link for the GF brownies doesn’t seem to be working. Are you able to help me find it please? Hey Ashley, I’m sorry our old recipe service Recipage is not working for us any longer. I do have a few gluten-free brownies to check out though (one in each of my cookbooks) and this one here: https://ohsheglows.com/2017/10/19/ultimate-flourless-brownies-for-two-cookbook-news/ I hope this helps and I’m sorry for the inconvenience! In looking at the vegan brownies two ways on your blog, I can’t get the recipe for the gluten free brownies to come up. This is the recipe that I’m really interested in. Can you help? Hi Sally! I’m so sorry, I don’t have it anymore as that old recipage service we used isn’t working for us any longer. I do have two awesome gluten-free brownies in my books though in case you have those on hand. Another option would be to try my Ultimate Flourless Brownies for Two: https://ohsheglows.com/2017/10/19/ultimate-flourless-brownies-for-two-cookbook-news/ Hope this helps! I’ve made the gluten free version of these brownies a bunch of times now and they are outstanding. Last time I didn’t have brown rice flour I but was able to substitute it with the same quantity of teff flour since they’re the same weight. Worked great! Also had to use 120 grams of blanched almond flour since I didn’t have any whole almonds on hand. By now I’ve written down the weights of all the dry ingredients in the margin of the cookbook since I love using my digital scale for baking (fewer dishes to wash!) 😉 Thanks Angela for such a perfect recipe. I LOVE THESE BROWNIES! However, the link to the gluten free ones seems to be broken? Can you please re-post them as they are probably the best brownies that I have ever had?! Thanks!!! Hi Nod, aww thank you! I’m sorry about the broken link. The Recipage server is not used anymore, but I will try to dig up that recipe somehow! These vegan brownies are an absolute staple for me! They are just like the ones I always had growing up from this insanely and unreasonably good brownie mix package (non vegan) from my local store in Switzerland. I’m sooooo happy I found this recipe! It’s the absolute best I’ve tried myself or tasted from other people :D!! Now I wanted to bring some brownies for my last day of work tomorrow and one of my coworkers is gluten intolerant so I looked for the full gluten free recipe. Sadly the link to the full glutenfree recipe doesn’t work though. Can you help please? So sorry about that! This recipe is in the old Recipage database and it’s not working anymore. Really disappointed that the recipe wasn’t clear in specifying that the brownies should not be cooked with the parchment paper on top. I left the parchment on top and they came out kind of steamed. 🙁 you should update the recipe to be more specific. When I try to go to the recipe for the GF version of your vegan brownies, all I get is a blank page. I know you use oat flour and almond flour, but I’d love to have the exact recipe. Could you remedy this problem? Hi Sally, Sorry about that! It’s because our old recipe system no longer works. I pasted the recipe above in the comments…do you see it? It’s under Kim Bennett’s comment. the recipage for the gluten free version isn’t loading :( i’ve made them so many times but don’t have it printed, saved, or memorized – my super bowl party NEEDS this!! The absolute best brownies! And they’re vegan. I’ve tried so many vegan brownie recipes since going vegan. They either come out terrible and oily, or else they’re the kind of brownies that others claim are “pretty good”, but you know they’re wrong. But these! These are the ones I’m bringing to my office to impress the cooworkers with vegan yumminess! There are a few gluten-free folks at the office, but sadly, the gf recipe won’t load! Does anyone know the ingredients for the gf? I just added the GF recipe into the blog post…please let me know if you can see it! Oh I wish the use of the microwave wasn’t in here, it is just so bad for your health. The ingredients that you need to melt are also very easily done in a pan. I love your recipes but please keep health in mind. Next post: The Happy Herbivore Cookbook & Giveaway!